Readers of When We Were Strangers may remember Lula, the cook and housekeeper for the Cleveland workhouse where Irma made collars. That was in the 1880’s. After the book came out, a suggestion was made by HarperCollins to write a sequel. For various reasons, I preferred a new cast of characters. My book in progress, though, is partially set in Cleveland. On the suggestion of our good friend Daniel, who’s an international agricultural economist but never hesitates to give advice on novel-writing, I’ve included Lula in this next novel. Lula now has a tavern called (imagine!) Lula’s. She is kind to my protagonist, Lucia, who is especially fond of Lula’s beer cheese. This was a common tavern item in the early 20th Century. I’ve made it several times. It’s a great Christmas present or party offering. Of if you want to open a tavern, you might consider stocking it. Comfort with a kick. Grate the cheese. 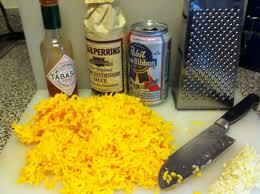 Put in food processor with garlic, Worcestershire, mustard and Tabasco and whirl until mixed. Drizzle in the beer, stopping when the consistency looks good for spreading. (You may not need all the beer. Drink what you don’t need for the cheese.) Stir in salt. Refrigerate. This is adapted from The Heritage of Southern Cooking, by Camille Glenn.